Playwright Mary Anne Butler never forgot that comment. It’s the direct inspiration for her new play The Sound of Waiting, which has been shortlisted for the 2018 NSW Premier’s Literary Award for Playwriting. It tackles the life-and-death scale of the refugee crisis and asks: who gets to decide where a person belongs and if they are allowed a better life – or any life at all? Written in Butler’s lyrical, world-summoning prose, and running for only 60 minutes, The Sound of Waiting is a plea for empathy from a broken heart. We meet Hamed (Reza Momenzada, who himself arrived in Australia by boat from Afghanistan in 2000), a man whose life unravels when his wife and son are killed by a bomb blast. He survives, and so does his young daughter. All that matters now to Hamed is getting her to safety. And then there’s another figure – no less than the Angel of Death (Gabrielle Scawthorn). She is one of many such Angels and her duty is not unlike that of a footsoldier in a warzone: to execute an order. She must extinguish Hamed’s life at the appointed time and place. This isn’t her first assignment; her wings are fully grown, her humanity and her ability to feel long gone – extracted with precision by vague expert spirits. All that’s left for her is the work. And all that’s left for Hamed is his daughter’s chance at a good and peaceful life. He faces checkpoints with bribes and fake papers. He treks with her through deep forest. He reaches the ocean and stares at an impossibly small boat. It’s not suited for the ocean. It’s rickety. There are too many for such a small vessel. It looks like death. It’s their last and only hope. 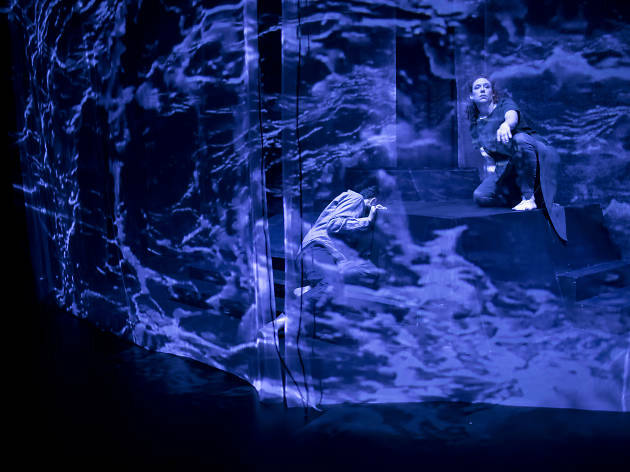 On a stage ringed with translucent curtains that project oceans, forest and sky (designed by Samuel James, with supporting sound by Tegan Nicholls and lights by Christopher Page), The Sound of Waiting feels like theatre told through a crystal ball: a contained sense of the human and the divine. It’s a heart-rending jewel you could pluck from the stage and cradle gently in your hands. It’s sentimental, but that isn’t a bad thing – it’s essential to Butler’s play and the key to its purpose. She is trying to coax compassion from her audience. 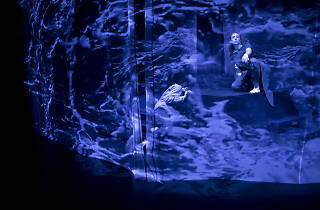 Directed with clarity and care by Suzanne Pereira, Hamed and the Angel stay close to each other but in their own narrative worlds, conscious of each other by varying degrees (the Angel is focused on Hamed, waiting for her moment, while he experiences her presence as an unnameable, unseeable unease). They speak in intersecting monologues, and it’s an image-rich summoning of story that mostly works, once the actors find their rhythm and the Angel’s identity and purpose crystallises. Toward the end of the play, there is a moment: Hamed looks out at the audience. The world is big enough, he says, if the heart is. The Sound of Waiting is a nakedly emotional play, but it doesn’t attempt to manipulate its audience to tears. Instead, it suggests that our capacity for compassion might be greater than even we know. It reminds us to care.